Johnson State College joined forces with Johnson Food Shelf and the neighboring communities the week before Thanksgiving to help feed hungry families. The holiday season often brings awareness of the hunger that families experience when costs are rising, and they can’t afford food. During Johnson State College’s first annual Thanksgiving Basket Sort-a-thon, students staff, and faculty assisted the SERVE office in putting together 50 boxes of Thanksgiving meals to be donated to the food shelf. Previously, departments and groups could make their own baskets and bring them to SERVE for delivery, but by doing it that way, according to Flint, they were causing more work for the food shelf. Some baskets ended up missing items that the food shelf then had to purchase, and none of the baskets were consistent in the product brands. To eliminate the inconsistencies and extra work, Sodexo purchased the food in bulk through their distributor for all of the boxes. This ensured that every box had the same brands, and the same amount of each food. In addition, Sodexo purchased enough to make extra boxes, so that any family needing a Thanksgiving meal would have one. All of that food was donated directly to the Johnson Food Shelf. In each basket, Johnson State College was able to provide corn, gravy, apples, potatoes, carrots, rolls, cranberry sauce, whipped cream, a pie, hot cocoa, margarine, and stuffing. “WLVB, the country music station in Morrisville, donates the turkeys,” said Krista Swahn, director of student activities and community service. According to WLVB-FM’s website, WLVB Vermont Country Morning Host Roland Lajoie was approached by local businessman Chris Potter, in 2000, to start a campaign to collect frozen turkeys for needy families. The first year that the turkey challenge ran, 250 turkeys were collected. Potter died of cancer the following year, so the station renamed the campaign in his honor. Last year, the WLVB Chris’ Challenge Turkey Drive collected 1,344 turkeys and $2000 cash for food shelves in Morrisville, Johnson, Cambridge, Hardwick and Woodbury. 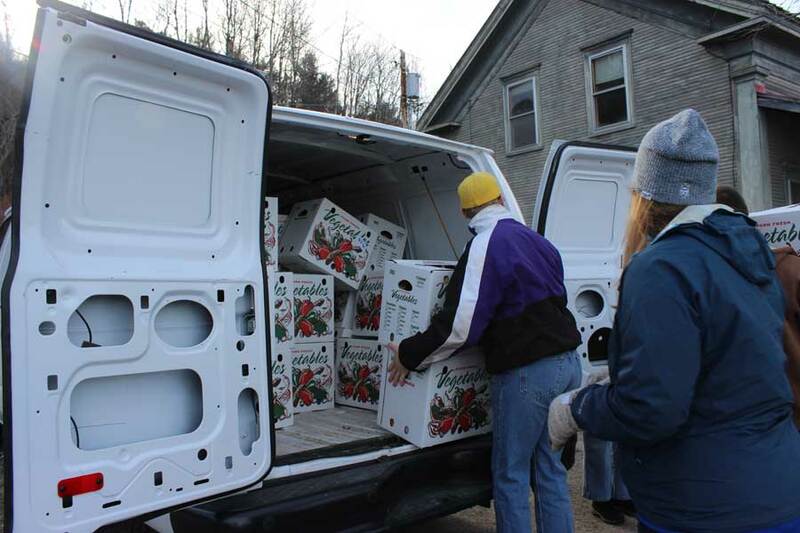 “The families in Lamoille County and the staff at the Food Shelf are grateful to the students, staff and faculty for the assistance provided to families in our own community that experience food insecurity,” said Director of Student Activities and Community Service Krista Swahn. Recognition must also be given to those who participated in the sorting event Wed., Nov. 20 , and helped deliver all of the baskets Thurs., Nov. 21. Each basket was to be distributed by the food shelf to families in the community who had registered to receive one in the previous week. Any extra baskets would then be given to those in need of a meal who had forgotten to register. The large contribution of baskets to the Johnson Food Shelf wouldn’t have been possible if not for the $1000 contributions from donors on campus, which included: JSC Dinning/Sodexo, Athletics, Science and Mathematics Departments, Writing and Literature and Humanities Departments, Academic Support Services, Student Government Association, JSC President Barbara Murphy, Dean Of Students and Office of First Year Experience, Badger Alternative Breaks, Business Office and Dean of Administration, Health and Counseling Center, Housekeeping, Registrars Office, Career Services, Administrative Assistant Cathy Higley, Library Circulation Coordinator Jeff Angione, Director of Student Acitivities and Community Service Krista Swahn, and Director of Public Safety Mike Palagonia.